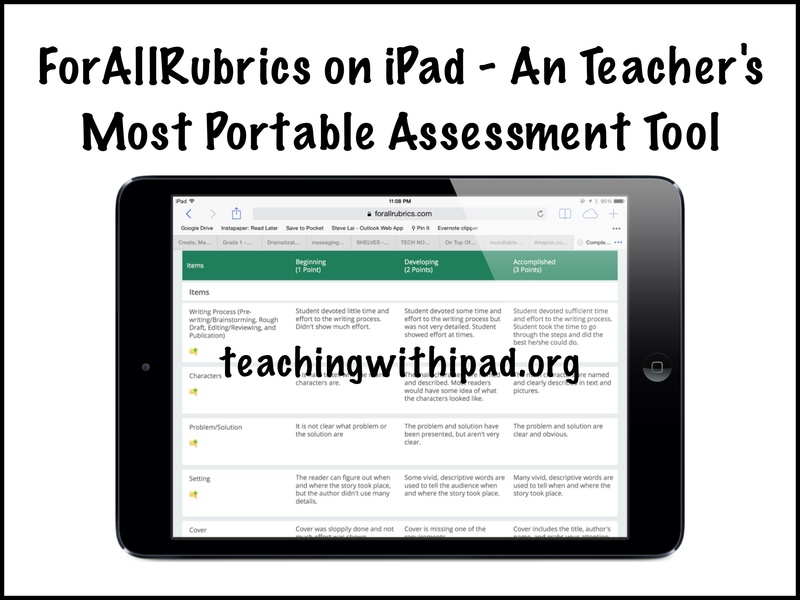 ForAllRubrics – Create, Manage, and Assess using Rubrics On iPad for FREE! ForAllRubrics is one of my best finds online in a long time. This is a free “service” for teachers that works on iPad and iPhone. 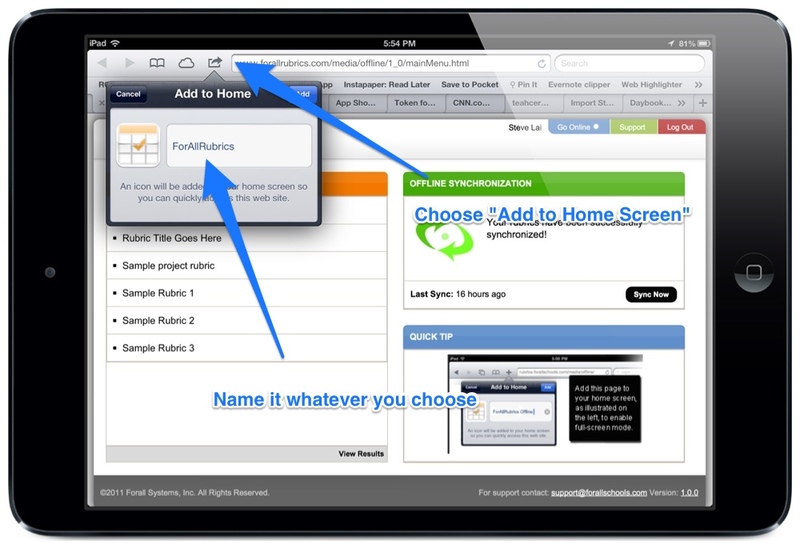 Now, teachers will be able to create rubrics and easily use their iOS devices to assess all of their students. This is not an actual iOS “app”, but rather a mobile web app. This means that you will not find it in the App store, but instead it runs off of your browser on your devices. Saving the website address to your home screen creates an icon which acts like an app. Sign up here for a teacher account. It is completely free. Setting up a few classes and rubrics will take some time. But once you have your classes inputted, the rest is easy. You'll get the hang of it in no time. While you can create classlists lists rubrics directly on the website, I would suggest doing it in Microsoft Excel, using the .csv templates that are provided. Remember to save each .csv file separately for each class and rubric that you have! All that is required in there are the first and last names, and a given “student ID”. You can input their email addresses as well (for emailing them their rubrics and marks). If are a homeroom teacher, you might find it easier to add each student one by one if you are unfamiliar with .csv files, but if you're like me (a language specialist with 14 classes), .csv is the only way to go. No one would enjoy individually inputting almost four hundred names. Once your classes are complete, go back to the website and choose “Import Roster” under the Admin tab and “manage students” section. 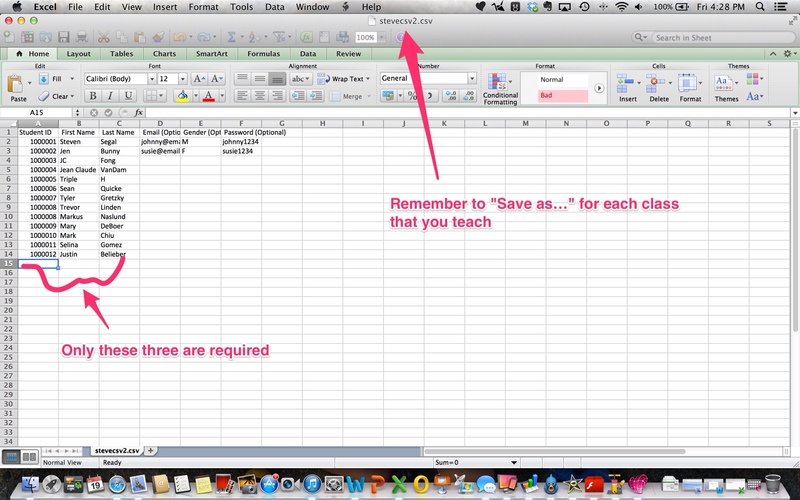 Remember to use the “Save as…” function in Excel. Import the rubrics on PC version of the website (not available on iPad). Synchronization is obviously an important feature of ForAllRubrics. 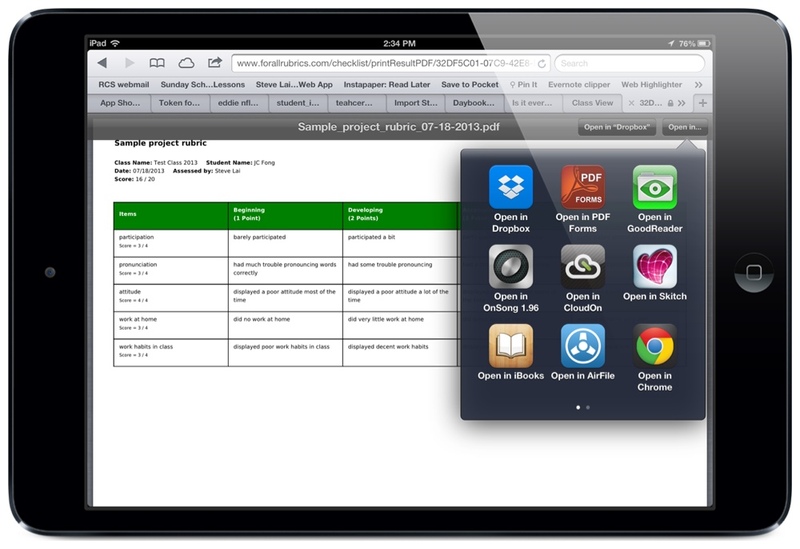 Teachers will want to ensure all the data inputted on iPad will make its way to the website. Make sure you always tap: “Go Online” and after a few seconds your devices will all sync nicely together. Remember to add the website to your home screen on your devices. This creates an “icon” where you can access the service as if it were an app. Unfortunately I did have some trouble working with their “Mobile Login”. This feature is supposed to give you data collection without requiring internet access. However, multiple attempts to sync any data while logged into this option failed. Everything worked fine on all devices under: “Website login”. Perhaps until the developers figure this out, I would avoid any offline assessing. 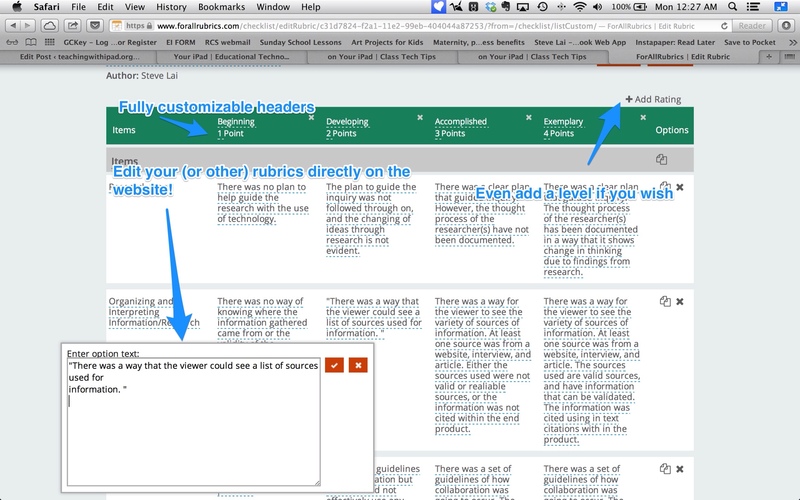 Make sure you are online when you are marking your rubrics. Avoid choosing “Mobile App Login” for now. I will update this section when a solution is provided. I did speak with tech support, and they did mention that this is a “work in progress”. There is also a very comprehensive FAQ section, based on their own blog. Take a look at it if you have any further questions. Your answers will be found there. Everything you need to get set up is clearly laid out for you. I can honestly say that I have been very happy to try ForAllRubrics out with my classes when this school year. For a free service, this is going to be an excellent way to further incorporate the iPad into my teaching (essentially the very reason for teachingwithipad.org!). This makes me want to use/create even more rubrics than I currently do. Rubrics are an ideal way of assessing students: Students are able to see exactly what is expected of them. They know the criteria for all the projects that are assigned. 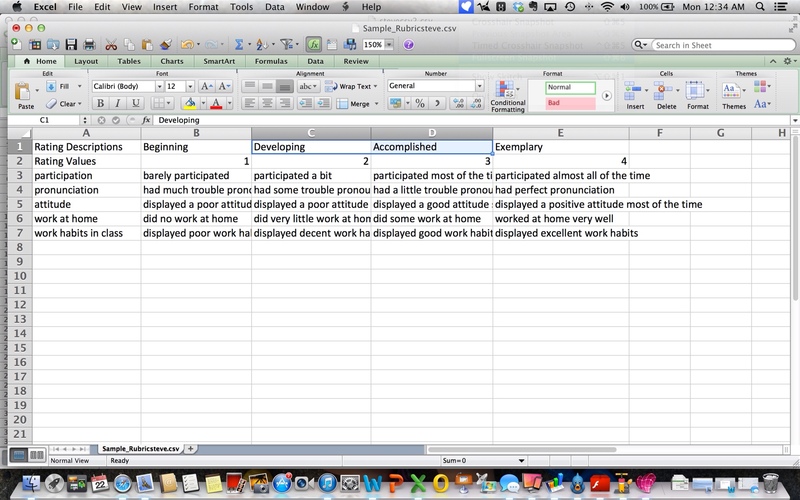 For educators, rubrics can give a clear picture of the strengths and weaknesses of the students. This is a win-win for both students and teachers. Grading is not the most fun part of our job, but I believe with ForAllRubrics, grading can become both easier and more convenient. It can eliminate paper as well: Graded rubrics don't have to be printed, but emailed instead to both students and parents. 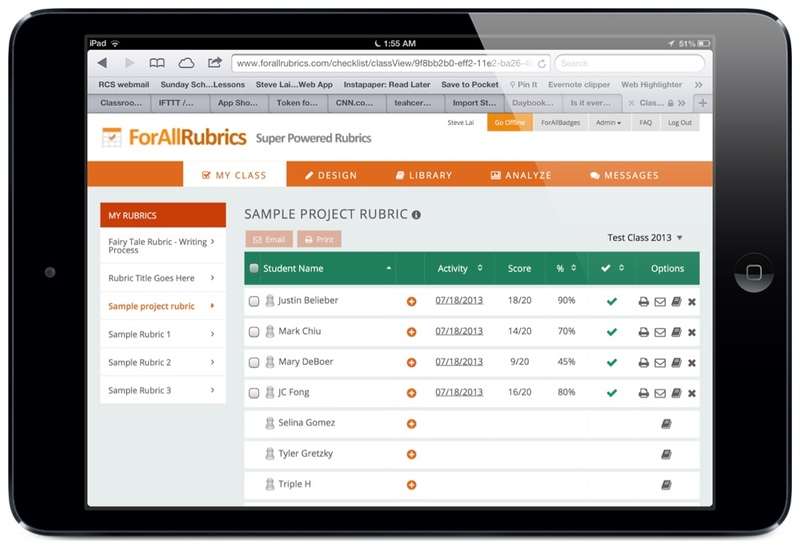 Give ForAllRubrics a try and you won't regret it once your assignments start rolling in. Thanks for one’s marvelous posting! I truly enjoyed reading it, you can be a great author. I will be sure to bookmark your blog and will eventually come back later on. I want to encourage you to definitely continue your great posts, have a nice evening! 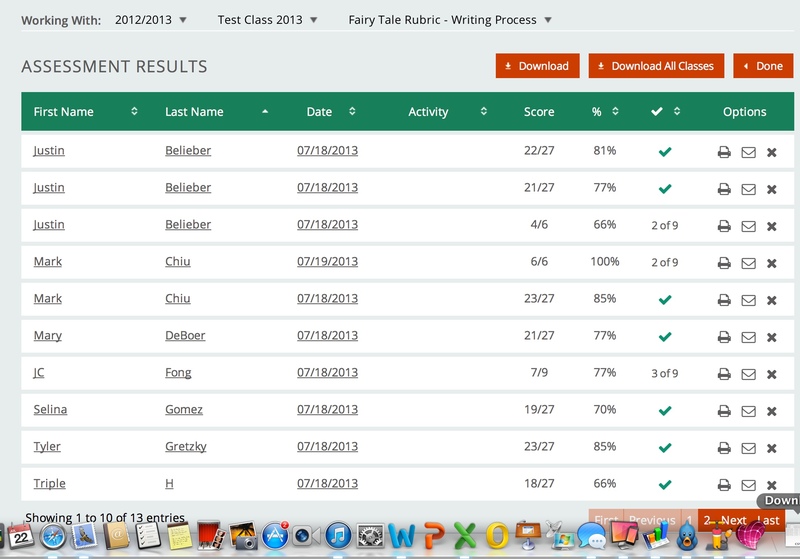 Pingback: Technology Bits Bytes & Nibbles | ForAllRubrics – Create, Manage, and Assess using Rubrics On iPad for FREE! 3GS. Wow. New technology is the best.